Bats are the only mammals that can really fly. Their wings are like human hands but they have very long fingers and the skin is stretched out between them. Bats can echolocate. This means that they shout using high pitched squeaks and listen for echoes to tell how far away things are. Bats can use echolocation to catch really tiny insects to eat – insects as small as 2mm long. They can also use echolocation to avoid tiny objects like thin wires or strands of hair. Bats never get caught in people’s hair! Bats are great at hanging upside down. Their bodies feel comfortable the opposite way around to ours. When they hang upside down, their little feet lock into place so that they don’t get tired and fall down. The blood doesn’t rush to their heads like it does for us if we hang upside down from monkey bars in the playground! Bats are long-lived even though they are very small. The oldest known bat in the world is a bat from Russia. A ring was put on this bat’s arm over forty years ago and researchers then found the bat, still alive and well and with the same ring, many years later. 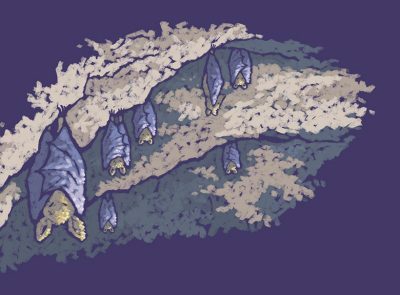 We don’t know how long bats live for in Ireland but we think that, on average, they may live for about 7 or 8 years. Bats use high pitched sounds to find their way around in darkness, this is called echolocation. Bats are well adapted for living in Ireland – they are active in warm weather when insects are out, but hibernate all through winter when there is not enough food for them to eat. Bats do a great job of eating insects that we don’t like – biting midges and mosquitoes for instance! Just one pipistrelle bat can eat around 3000 of these in one night so, the more bats there are, the better for us! One of the world’s smallest mammals is a bat called Kitti’s hog nosed bat or the bumble bee bat. It lives in Thailand in Asia and is about the same size as a large bumblebee! 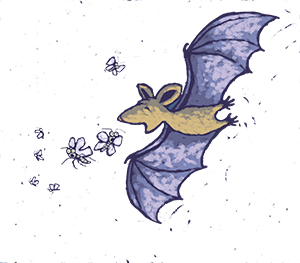 Now that you have read all about why bats are special – do you think you can answer the questions in this worksheet? The smallest bat in the world, Kitti’s hog nosed bat, is the size of a bumblebee!